At night, cold and flu symptoms can feel the most intense, and a stuffy nose or sneezing can make it impossible to fall asleep. 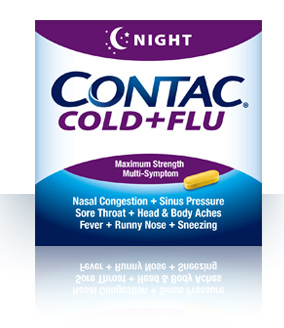 Contac® Cold + Flu Night delivers powerful relief from multiple symptoms in a single does – and at the highest possible strength without a prescription. Get relief from the stuff that keeps you up at night, and wake up refreshed. Inactive ingredients: Carnauba wax, crospovidone, D&C yellow #10 aluminum lake, FD&C yellow #6 aluminum lake, microcrystalline cellulose, polyethylene glycol, polyvinyl alcohol, povidone, starch, stearic acid, talc, titanium dioxide. More than 8 caplets in 24 hours, which is the maximum daily amount. Sore throat warning: If sore throat persists for more than 2 days, is accompanied or followed by fever, headache, rash, nausea or vomiting, ask a doctor promptly. Pain or nasal congestion gets worse or lasts more than 7 days.